May you all have a great Sunday! Hello. It’s been awhile. I’ve been meaning to update this blog but just have not gotten around to it. It wasn’t because there was a dearth of things to write about. Quite the opposite; there were too many things to write about — books, movies, plays, people, places… life. How does one choose? 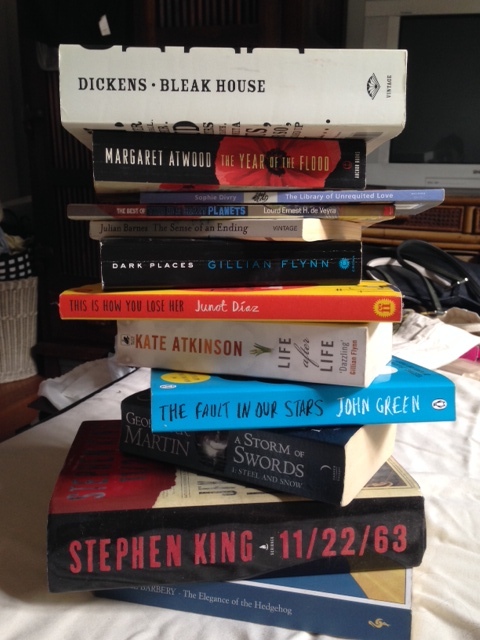 Anyway, several friends on Facebook have tagged me to list 10 books that have made an impact in my life. I’ve done this list at least once before, and even then it’s hard to limit the list to just 10. How do you define “impact,” anyway? I’ve read books that I’ve thought of as “fluff” that I still remember years later because they made me look at a situation in a different way; others have turns of phrases, elegant words used, a scene that was just so poignant I could cry; funny moments; fast-paced action…. It’s just hard to choose. Sooo… because the blog needed updating and I needed to write this list, I figured I’d just do it as a blog entry. Two birds with one stone and all that. I’m tweaking the criteria to books that I’ve read or reread in the past year and a half that I’ve loved — for whatever reason. Some of the choices will have links, as I’ve written about them at some point. As bonus, am adding quotes and excerpts so you get a flavor of the books. Have a taste and see if you like them.